ICO Subpoenas Start Piling Up Courtesy of US SEC. Perhaps not as bruising as a “WWE Smackdown,” the United States Securities and Exchange Commission (SEC), America’s primary securities regulator is advancing an Initial Coin Offering crackdown aimed at both Issuers and enablers of ICO capital raise campaigns that have collectively raised hundreds of millions of dollars via ‘ICO pre-sale’ schemes’ for digital coins and digital utility tokens, as well as through ‘official launch’ sales facilitated by the assortment of bitcoin coin exchanges–none of which are regulated by traditional regulatory regimes. According to multiple news outlets, in recent weeks, the SEC has sent subpoenas to dozens of tech companies and individuals who are involved in cryptocurrency, including crypto crowd thought-leader Patrick Byrne, the founder of Overstock.com and his company’s cryptocurrency-focused subsidiary, tZero. Overstock (NASDAQ:OSTK), the first online retailer to accept bitcoins back in the beginning of the decade, launched tZero in August 2015 as an alternative platform for trading securities. It announced the token offering in late 2017, which caused the share price of Overstock to skyrocket from the low 20’s to nearly $90 per share. In the Thursday filing, the company reported that it raised $100 million, from 1,100 purchasers, of a planned $250 million offering of tokens. The tokens haven’t yet been issued, the company said, and gave no assurance that it will ever issue the tokens. This ‘little caveat’ on the part of tZero, as well as other issuers who are taking in money via ICO sales is one of the several reasons why the SEC is inserting itself. Upon this week’s news that OSTK was smacked with a SEC subpoena, the company’s share price has fallen 20%. The targets of the initial coin offering crackdown subpoenas include potential SEC enforcement actions against companies that have launched ICOs, the cryptocurrency equivalent of IPOs, as well as their lawyers and advisers. The subpoenas reportedly include requests for information on how ICO sales and pre-sales are structured, the anonymous sources told WSJ. The SEC is also requesting the identities of the investors who bought digital tokens, The New York Times found. The SEC declined to comment. Peter Berkman, a Florida-based securities attorney and US Federal Bar Association member who also advises investor document preparation firm Prospectus.com, stated “Nobody should be ‘shocked’ that regulators are stepping up their scrutiny of the ICOs given that many have the characteristics straight out of “Boiler Room 4.0.” There’s a cadre of bad actors and so-called promoters who are preying on the naivete of start-up entrepreneurs as well as the greed profile of unsophisticated investors.” Added Berkman, “There are steps that ICO issuers can take to stay inside the regulatory goal posts, or at very least, under the radar given that SEC rules for ICOs remain in the ‘forming stage.’ Issuers are compelled to understand the term “Caveat Venditor”, unless they be moved to the top of the SEC’s ICO Subpoenas list.” Prospectus.com thought-leaders were arguably early to opine that accredited investor guidelines should be embraced by ICO issuers. The firm has provided multiple crypto cool kids and start-up entrepreneurs with a best practice approach to raising capital in the course of advancing digital token and digital coin offerings. Over the past few months, the SEC has hinted at a crackdown on ICOs, which is a relatively new field that has not seen a lot of regulation compared to initial public offerings. In comments to the Senate banking committee earlier this month, the SEC’s chairman Jay Clayton revealed that zero ICOs had registered with the commission as of February 6th, although such offerings have become wildly popular since last year. 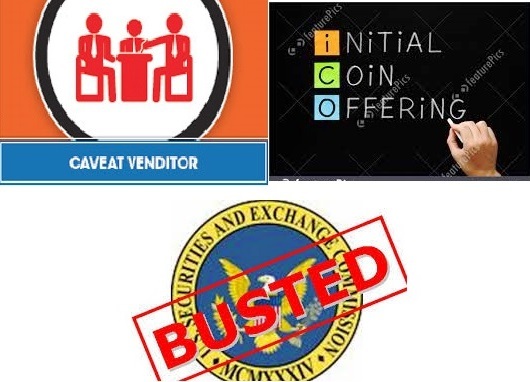 This entry was posted in Prospectus and tagged caveat venditor, ICO accredited investor, ICO pre-sale, ICO subpeonas, initial coin offering crackdown, initial coin offerings, Jay Clayton, patrick byrne, Prospectus.com, sec enforcement actions, SEC rules for ICOs, startup, tZero, utility tokens. Bookmark the permalink.